When I saw these in the store, I knew I had to get them! I love all things mini. 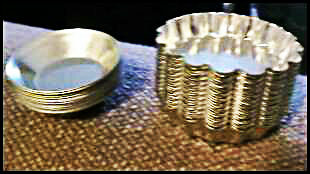 There’s just something about the small size that grabs my attention more than the full-size version. Mini Snickers bars that somehow only make an appearance on Halloween. Mini muffins or cupcakes. Mini loaves of bread. Mini. Easy. One or two bites. An amuse bouche. A petit four. Mignardises. How ever you put it, I love it! 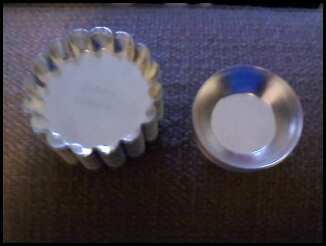 I used these to make tartlets for New Year’s Eve this past year (2011-2012). I made chocolate ganache and orange curd tartlets. I sprinkled the chocolate ganache ones with white sugar crystals (the sort of sugar that does not dissolve) and the orange curd ones with homemade candied orange zest. 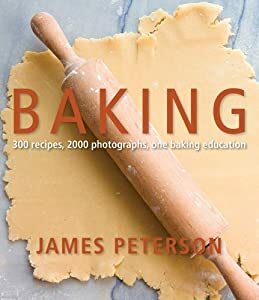 I got the recipes from one of my favorite cookbooks, Baking, by James Peterson. I like this book because it not only gives you great recipes, but because it shows you steps by picture and gives you more than one technique to doing something. For example, the tart/pie dough recipe can be made with either water, heavy cream, or eggs/egg whites as the liquid (or any other liquid–maybe orange juice). It also says how to mix the dough by hand (on a table or in a bowl) or by mixer. It is a great book for all of the basic baking you might want to do. This entry was posted in celebration, chocolate, dessert, dough, holidays, New Year's, orange, party, pie, pie dough, sprinkles, sugar and tagged Baking, Sugar. Bookmark the permalink.